When it comes to software, a good programmer matches the programming language to the needs of the application. That statement also holds true for materials handling, as leading software developer Borland International recently discovered when it upgraded distribution operations. By carefully matching traditional materials handling equipment, such as flow racks and conveyors, to its handling requirements, Borland more than doubled the picking productivity at its Scotts Valley, Calif., distribution facility. And it spent under $150K to do it. Rapid growth was the primary driver behind Borland's warehouse modernization project. A doubling in sales over the past two years, as well as the acquisition of software house Ashton-Tate late last year, resulted in a sharp increase in customer orders and a proliferation of stock keeping units (SKUs). The facility currently processes approximately 7,000 orders daily and handles 1,400 different SKUs. A shift in the customer mix also drove the need for change. Through its innovative Direct Marketing Program, Borland was doing more business directly with the end user. "These type of orders, which typically consist of a single line item, now account for about 85% of our order volume," says Vaughn A. Sucevich, vice president of operations. With this change in activity levels, the capacity of Borland's warehouse was beginning to strain at the seams. 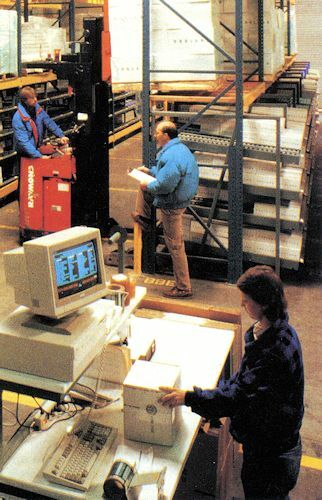 In the previous system, active stock was assigned to picking locations in the bottom row of 3-level-high pallet racking; reserve inventory was housed in the two rows overhead. Equipped with carts and pick lists, workers filled orders by walking and picking cases or cartons from pallets. The fact that a single pallet resided in a forward picking position not only limited the number of available pick faces, but also reduced picking productivity. Order pickers typically had to travel longer distances between making their picks. Combining reserve and active storage in the same front-loading rack system also created congestion. Picking and replenishment activities took place in the same aisle and frequently at the same time. Furthermore, wide aisles were needed to accommodate lift trucks. This inefficient use of floor space reduced the area available for staging completed orders before shipping. To improve warehouse operations and gain some badly needed space, Borland might have considered adding on to its existing facility or building a new one. But the company felt that it could accomplish its goals without bricks and mortar. For assistance in identifying strategies for improvement, Borland's primary project team, consisting of Sucevich; Cynthia Farmer, manager of distribution services; and Bruce Runyan, vice president of MIS, elected to work with an outside consultant (RWH Associates). "Our team collectively has a lot of years of experience in materials handling and distribution, so we were really looking for someone with more than just expertise," explains Sucevich. "We wanted someone who would also look at things from a whole different perspective and bring new ideas to the project." Although the team evaluated a wide range of materials handling alternatives, it was traditional equipment that most closely met its needs. "Because out rapidly changing business requires a high degree of flexi bility, we feel that the level of automation we chose is appropriate for our stage of growth," says Sucevich. "And it helped us to keep our costs in line." Rather than buy all new equip- ment, the company minimized costs by modifying and reconfiguring the existing pallet rack. By removing the existing load beams from the bottom level of the rack structure and replacing them with carton flow rack Borland created thirty carton (or four case) pick faces per pallet rack bay, as compared to just one before. In all, the new rack configuration features 1,440 carton and 192 case pick faces, and 188 bulk storage locations. The modification also helped to increase picking productivity. The fact that just one carton resides in the forward position of each pick face means that a large number of SKUs are presented to the pickers over a small area. The reduced travel distance and greater selectivity has been a big factor in boosting pick rates. Order pickers now average 156 picks per hour, compared to just 67 before. Another advantage of the flow rack is that it provides for constant replenishment from the back, insuring first-in, first-out stock rotation. And because picking and replenishment activities now take place in separate aisles, Borland was able to narrow the width of picking aisles to just 4 ft. Replenishment aisles, which accommodate lift truck traffic, measure 8'/2 ft wide. In addition, rotating the rack structures 90 degrees shortened picking aisles and created an efficient, U-shaped flow pattern. To further streamline flow and minimize handling, Borland also installed a low pressure, accumulation conveyor in the order packing and staging area. Doubling as a sortation system, each of the system's five lanes corresponds to a specific shipping destination. To expedite loading, a skatewheel conveyor is extended directly into a trailer as it pulls up at the dock. Out the door in "24"
Those improvements have also helped Borland to reduce the cycle time required to process customer orders. While it once took an average of 2 to 3 days to process an order, the facility now does it in just a day. Borland calls it, "Out the door in twenty four." A new inventory control system, which combines bar codes and computers, is helping to ensure fast, accurate handling of orders. "We refer to it as a "closed loop" system because it monitors and tracks the flow of orders through the entire facility," says Runyan. "It's nearly fool-proof against errors." A two-step verification process also helps to ensure near-perfect order accuracy. First, the packer scans a bar code on the picking ticket on the product. In the case of a mismatch, the system beeps, advising the operator that there is a problem. If a match is made, the carton travels on to an automated scale. As the carton passes over the scale, the system performs a second check by comparing the theoretical weight of the package to the actual weight. "Order accuracy is important to us because customer satisfaction isn't just about how well our products perform," says Sucevich. "It's also about getting the right products into our customers' hands to begin with." Attention to details like that is one reason why computer users rated Borland number one in customer satisfaction earlier this year. Now that the new system is in, the "best" is about to get even better. For just $142,000 we doubled picking productivity!